Our Mega Office Supplies Warehouse staff Josh and Marty show how easy our office chairs are to assemble in a chair assemly race. The specific chair they’re assembling is the Rapidline EC07 office chair. These chairs offer an economical seating solution for everyday operations and comes in a medium or high back. The Rapidline eco70cm office chair is fully ergonomic and AFRDI rated level 6 (up to 110kg). All chairs are available in three colours: Night Flight, ADK Charcoal and SF Black. 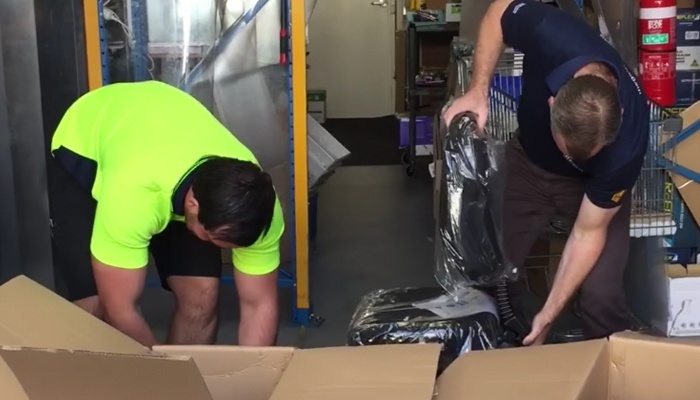 Josh and Marty have shown how easy our office chairs are to assemble, but even if you’re not as quick as them, you’ll be up and running (or sitting) in under 5 minutes! We have a variety of options that can be included with your office chair – but please note these might add a few extra seconds to your office chair assembly time! A drafting kit allows the chair’s height to be raised. This is perfect for architects, engineers, or anyone using a higher desk. A chrome base can replace the black base provided so your new chair matches your office décor. Adjustable arms fit all operator chairs, providing arm and elbow support. Discover our complete range of office chairs and complementing office furniture. Leave a reply to let us know what assembly challenge should the Mega Office Warehouse boys take on next.